While 12-15 knots is actually quite fast for a racing sailboat in good windy conditions, high-caliber racing sailboats can do more than 20 knots in high-wind situations. In fact, TransPac TP52 sailboats for example, have been clocked around 30 knots for short burts. That’s nearly 35MPH for easy comparison! And a TP52 is a monohull! Trimaran and catamaran sailboats are typically much faster. On a sailboat, those kinds of speeds feel quite incredibly fast. Doing 20 on a sailboat feels like doing 40 in a powerboat – possibly even more exhilarating than that! Specially given the fact that to go that fast it has to be very windy, which in turns equals choppy seas unless you are in some narrow channel. Consider what it might feel like doing 20 knots in choppy seas where the boat is hammering into wave after wave. You can probably imagine the excitement. Most of the above comments are based on above average sailboats. Well, to be fair, a TransPac or Santa Cruz 52 is well above average. They are in super boat territory. But, there exists a certain breed of speed sailing boat that is at a whole other level of performance and speed unattainable by standard production boats – Boats that are purposely built for speed as the number one priority. If a TP52 is a super-boat, the way a Ferrari 360 is a super car, the freaks of nature we are talking about would be hyper boats. The same way one would call a Mercedes McLaren 722 a hyper car, boats like the wing-sail AC45 and AC72 developed by the Oracle team for the America’s Cup would be exactly that. These boats which run on a new class in the America’s Cup, are capable of average speeds over 30 knots. Multi-hulls is what the America’s Cup is all about these days, with full teams racing them. Much harder, but much faster and much more exciting for those who love to see fast sailing. In essense, the AC45 is being run during the America’s Cup World Series events in preparation for the America’s Cup in San Francisco in 2013 where the larger AC72 will be raced. These are like sailboats on steroids capable of performance and speed like no other. Most of these hyper-boats are either multi-hull catamarans or trimarans and the random hydrofoil like the l’Hydroptére shown in the photo at the top. 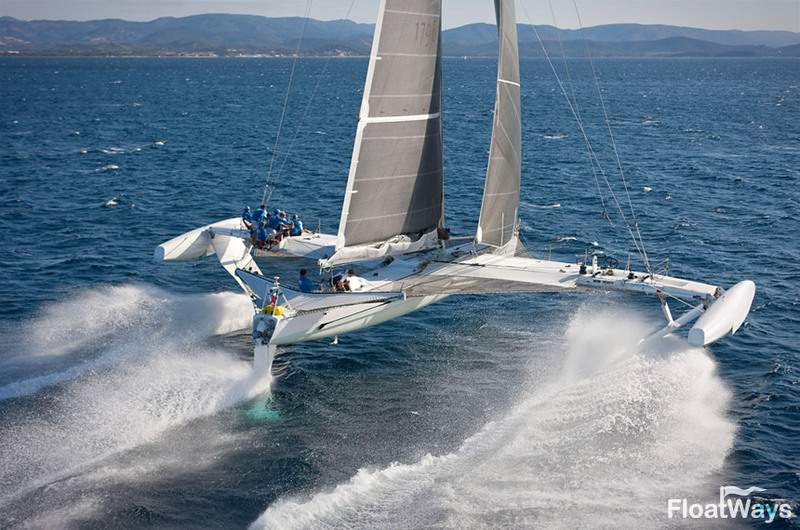 But while a multi-hull sailboat is almost always faster than a monohull, you can’t completely write-off a mono. There is a certain breed of monohull sailboat capable of speeds close to 40 knots with sustained distance-averages up in the 20’s. Once such boat is the Mari-Cha IV, a carbon fiber mono-hull that holds the world record for the fastest single-hull sailboat to cross the Atlantic. According to the WSSR and ISAF, the 140-foot monster yacht crossed the Atlantic in 6 days, 17 hours, 52 minutes and 39 seconds at an average speed of 18.05 knots. There will always be a place for fast single-hull sailboats even if the latest trend is toward multihulls for the sheer speed. 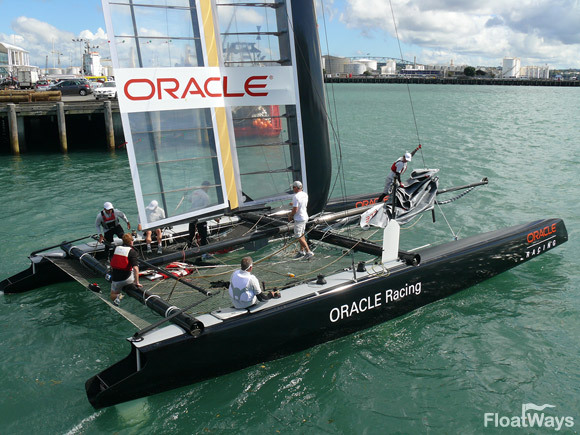 Plus, keep in mind that until recently the America’s Cup was done with mostly mono-hulls. There are also plenty of major regatta’s dedicated to monohulls. For the combination of speed and rough-seas ability, fast single-hull sailboats will always have a place. Then there is also the very well known sailing craft, which could also be considered a monohull, called the windsurfer. Yes, we’re talking about the guys on a surfboard with a sail on it! As common as they may seem, they are actually one of the fastest sail-powered crafts on water. And of course, we have to mention the kiteboarders which are actually even faster than the windsurfers if the conditions are right. There’s a lot of debate however as to whether a kiteboarder can be considered a sail-powered craft but we’re simply not going to get too much into the stupid politics related to that. Top speeds are usually calculated over short distances such as 500 meters. Most of the fastest sailing vessels can reach high top speeds but because they cannot sustain the speed for long distances, average speeds over long passages seem somewhat low for inexperienced eyes. However, let’s look at the more common “boats” that are actually FASTER than the strange (and expensive) speed machine sailboats listed above. Antoine Albeau holds the speed record on a windsurfer at 49.09 knots (59.49 MPH) – Not quite as fast as some of the mutant sailboats, but still one the fastest sail-powered crafts over water. Finally, an American Kiteboarder Rob Douglas did 55.65 knots (64.04 MPH) over the waters of Luderitz, Namibia while kiteboarding, making him the fastest sail-powered vessel in the world! However, ISAF does not want to acknowledge a kiteboarder as a sail-powered craft claiming that a kite is not a sail. (Even though it’s powered solely by wind). That’s up for debate, and nothing takes away the fact that it’s the fastest wind-powered craft over water. Of course, these are the current records and someone will soon build something that will break them. But, top records aside, it’s the fact that a sail-powered craft can go THAT fast what really matters. Yes, sailing is exciting. Next time some petrol-head wants to argue about how boring sailing is, show him this article and teach him a thing or two about speed sailing!